Final Roll Call was held today for five soldiers killed near Baquba on 24 January 2005. The soldiers were conducting combat operations in support of Iraqi elections when their Bradley Fighting Vehicle rolled into a canal. The accident occurred after erosion caused a dirt road to collapse under the weight of the vehicle. Two other soldiers were injured. While hundreds of soldiers assembled for the memorial, at least six helicopters kicked up dust nearby. Major General Batiste and other senior officers, and NCOs from the 1st Infantry Division, landed to pay final respects. The soldiers were members of Alpha Company, Task Force 82nd Engineer, 1st Infantry Division. The air was cold under overcast skies and the event was predictably somber. Yet the overwhelming sense from the hundreds of soldiers present was resolve. 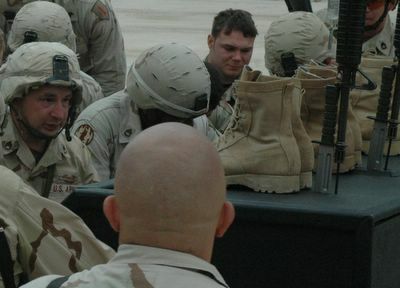 After the ceremony, dozens of soldiers spontaneously collected around the helmets and boots of their fallen comrades, seemingly unwilling to leave. As helicopters started their engines and finally lifted off nearby, tears streamed down soldiers’ faces, and some of the journalists present were visibly moved at the sight of the soldiers of the 82nd Engineers honoring their fallen.